What a strange, what a beautiful story is that of Anthony Rolfe Johnson, this tenor who slumbered long and only woke up at the age of 33. Born in 1940 in Oxfordshire, Rolfe Johnson saw his whole life turn upside down when, late in life, he discovered his voice, one of absolute rarity. Dying in 2010, Rolfe Johnson was one of the first great voices considerably to have broadened the operatic repertory from Monteverdi to Britten. This disc is a poignant homage to this timeless artiste. He who always answered �yes� to all who asked for him did so with astounding humility, as if music itself were speaking in his name. 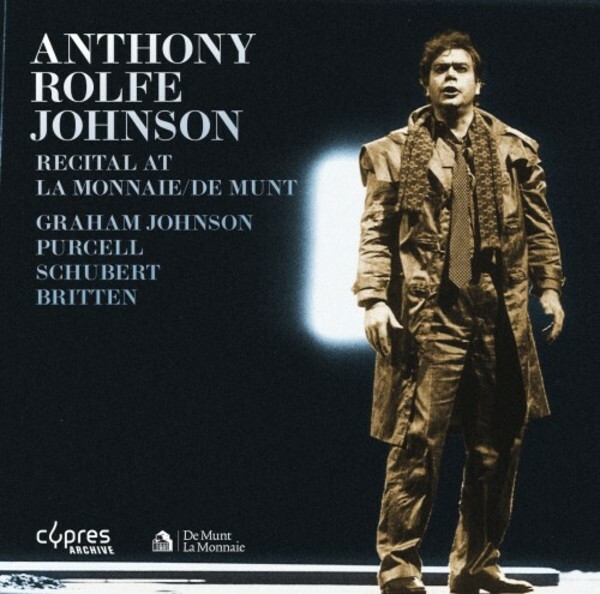 This recording will enable you to relive the thrilling recital given in 1996 by the celebrated English tenor accompanied by Graham Johnson on the piano, a recital taken from the inestimable archives of La Monnaie. Rolfe Johnson performs Purcell, Schubert and Britten, three composers he placed above all others. This is a deeply moving recital of such sensitivity as is rarely found, and this disc will make you vibrate to the very core of your soul.